In 1860 the U.S. didn’t have a way to communicate quickly from the east coast to the West. 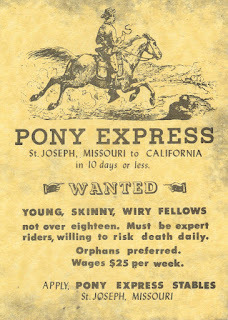 Train travel didn’t extend to the west coast nor were there transcontinental telegraph lines at that time so a short-lived solution resulted in the creation of the Pony Express. With its mission to deliver mail and news as quickly as possible from Missouri to California, a continuous relay of horse riders would cover 1800 miles (2900 km) in just 10 days, serving as the first main postal link between the East and West. Existing for only 19 months, this system of communication was expensive, operating like this: There were 157 stopping points, called stations, which were 10 miles (16 km) apart. This was the best distance for horses to travel efficiently at full speed before becoming too tired. 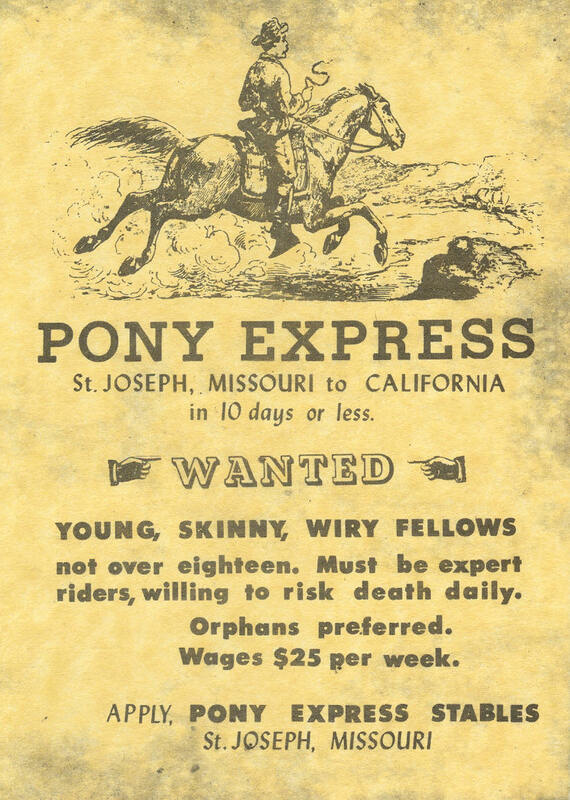 The rider would average 50-80 miles per day (80-128 km) and the stations are where riders would switch horses before continuing on their way across the prairies, plains, deserts, and mountains of the western U.S.
Because it was so costly to maintain horses and riders on a continuous basis the Pony Express went out of business in November 1861, replaced by the new lines of the transcontinental telegraph. It seems like a romantic image of the West to imagine this committed network of riders and horses traveling alone in the rugged, untamed terrain. The Pony Express route has been recognized as a National Historic Trail and is protected by the United States.